I have much more on this family, both descendants, and ancestors, see Lineages page, Hyde File, and Norton File. Old family photos are precious! 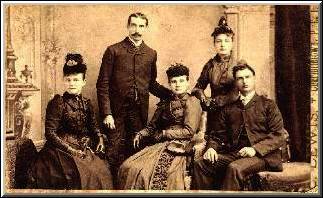 This photo shows some of my Great-Great Grand Father, Samuel Hyde's family. Left to right - "Bertie" Hyde 1868-1949 my G-G Aunt, wife of Fred Smallwood, "Joey" Smallwood (the last "Father of Confederation")'s uncle, George BYRON Norton 1866-1949 my Great Grand Father and the author of this diary, Matilda Adelaide Hyde 1864-1914 my G-G Aunt who married James D. MacMillan, Gertrude Penelope Hyde 1870-1943 my Great Grand Mother, wife of George BYRON Norton, and George Albert Moore, Samuel Hyde's adopted son. 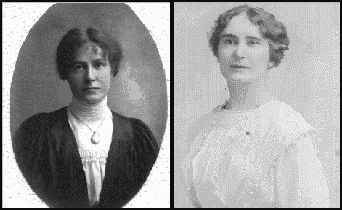 The Hyde family lived in Meadowbank, P.E.I., while Byron and his wife lived in Charlottetown. All of these people are mentioned in the following diary. family; Joseph Seaman's wife, Sarah, was Byron's sister. 2. This diary was originally written in a tiny 3" x 4 3/4"
this document has been placed in the P.E.I. Archives by the Hunter family. 1995. Entry dates have been standardized for clarity. and Gertrude Penelope, youngest daughter of Samuel Hyde, Esq. Today we chronicle the wedding, at the home of the bride, of Mr. G.
night. Baby cried at intervals most of the time. G.B.N. day but slept nearly all night - Pensy well - weather fine. Baby quiet - and good - slept most of the day. Pensy still well. Weather cloudy - not so cold. day. - Grand M. H. [Hyde] with Pensie. Grand M. N. washes Baby each day and both seem to enjoy the job. G.B.N. Baby's eyes are now a dark blueish grey. all day and sleeping now. - 8 P.M. Pensie doing well, Grand M.
Norton here part of day - Weather fine and somewhat warmer. Baby staid upstairs most of the night and was very good all day. Cold but finer. Doctor called today - all doing well. St. John's, nee Hyde] in by steamer and Moore in by horseback. Weather fine and warmer. Baby sleeps well these nights. day - Trying to find a name - G.B.N. Fair and warm. Baby well. Pensy almost as smart as ever. Mrs.
Hyde and Sarah [Norton] papered D. Room today. on here now. Pensy just about as well as ever. Weather warm yest. - stood 80 in shade - not so warm today. during day and bal. of night. Seaman cried too and Grand Mother had a hard time with them. Home tonight - Baby has a light cold in head. Baby weighs 12 lb. today. One month old today. Baby went down this afternoon with its Mother and Aunt Bertie. slept all the time - cried sometime during night. to her by her mother. G.B.N. with her mother - asleep. now and very little bother. Went to Belleview July 1st and staid till July 2nd (night). July 18th and I went down each night and back in the morning. Weighed Baby today. 15 lbs. 3 mos. old today. Went out to West River. Mother and Baby driving. I on bicycle. on Tues A.M. Fallen trees all along M.B. road and mud very deep. Pensy and Baby got home this A.M., both looking well. Baby is now nearly 5 mos. old and getting much nicer and nicer. Her Mother discovered Baby's first tooth today (Lower jaw rt. hand side) Baby is getting very good and much less troublesome. the table and is getting to be quite good. sooner than I had hoped. not yet in working order but otherwise we are quite comfortable. she will be able to go round fairly well. I am doing at the desk. another corner of the room. Baby climbed all the way up stairs today. of writing and as fast as her Mother takes her away, she creeps back. Baby's Mother was Baptised last night. way - way", "Papa", "Mama", "baby", "Pitesy" for pretty, "Dawdelaw"
board for nearly a week. likely soon be done. Painting the front of the house today. yet, on any question. Baby weighs 23 lb. but not withstanding all a dear little thing worth her weight in gold. windows as she passed. Baby has been weaned since May 25th. now. She is bothering me until I have to stop writing. Been so busy of late no chance to write. located on George Mutch's shore at Keppoch]. We struck our tent and came into town today. had to put her to sleep before she would forget it. - Wt. 23 - 24 lb. Papa, and all the Seaman children and MangMa she calls by name. charge on me and now I have to stop. to the shore and altogether had a nice time. says and does lots of other nice little things. Wt. today - 26 lb. she wants. Yesterday was Thanksgiving day. Little baby one mo. old yesterday, wt. full 10 lb. without wraps. This baby is less troublesome so far than Bernice was. when you talk to her. Baby is a lot better and not as much trouble as B. was at her age. She is about her sick turn, I hope. "Palli" [Parlor] and "Sissy doing sleep in tot" (cot) "up a toys"
upstairs and Nonie is out to church. Bernice is now quite a big girl and the best and sweetest one in town. inquiry we found that it was telling us about the foregoing incident. dear little midget - and plump and strong and big for a child 23 mos. old. We had a picture of both of them taken two weeks ago. At 6 1/2 mos. little Baby is not 14 lb. biscuits and milk. She is now quite bright and interesting. her last week, she is a cute sharp little mite but very little. weighs 34 - 35 lb. little mite and very interesting. talked like this "Do you hear the chilly skreeling out a skreet"
to tell us of it. a spoon, nearly always takes her dinner so. out of hand says only two or three words "wha is" and "wha that"
and will be all right and no older as she gets a little older. June 7th 1896 - Weights - Baby Ethel - 24 lb. Bernice - 35 1/2 lb. a good big thing and does nearly everything she is told. First memo since coming in from camping at the shore - Belleview. says "Big Big Lacy Lummey" (Big Racers is running). over to see Bob McMillan's new house he was moved last Thursday. seems to be softening again. bed talk and play for a long time, sometimes till nine o'clock. Everything else she says is put in the oddest little pigeon English. little turns. We had the two babies' pictures taken last mo. (Dec 96). his mouth and began at the same scripture and preached unto Jesus." together and get along nicely sometimes for long stretches at a time. her ev. prayer as sweetly generally as anyone ever said it. weeks and this is the first Sunday I have not got out to see them. says she is. They have been having a good time at "Dammie Hyde's"
apples, etc. and have been all round busy and happy girls. yesterday evening. Mr. Norton's two, Mr. J. D. Seaman's six, and Mr.
every pedestrian turned to look at them. Yankee twang that sounds very comical. they "stamped" each "white-horse" they saw [lick a finger and "stamp"
and we all had a general good time. at the shop yesterday and to get a ride in the elevator. Boers declared war on the 12th inst. certificate in school for botany collection but the "Little Fellow"
helped her with the gathering of the specimens. Penzie and children went to West River. Bernice has mumps. All came home New Year's Day. Jan 24th Henry Hyde died last night. More than a year since writing here. On Jan 25th in big snow storm, walked in from West River. doing well there. The MacMillans have not yet started for the West. be the worst winter seen here in years. steamers, no trains, cuttings on the R.R. long and 20' to 26' deep. again. We are well and the girls are getting as big as their mother. B. is doing fine at school. Uncle Rupert [Seaman] died at 1 A.M. today - buried at Brudenell on the 8th. often scratched and dug in. sunny, somewhat below zero but fine and calm, seemed not so cold. we stopped her there. Roads and car-ferry all stopped with snow and storms. Buried our darling Ethel today. looking down at the deck and her sister's coffin. unable to go on account of the railway tie-up. talented and with a nature of more than ordinary promise before her.